It may be superlative at an extent but it is said that Cricket is a religion in India. It is highest money spinner sport in India without a doubt. And this situation is not came to existence recently. 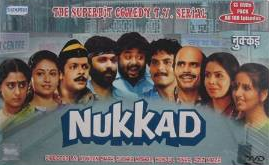 Way back in the the Golden time of Doordarshan, there was an entire episode of Hindi TV Serial Nukkad dedicated to Cricket! This episode is not just for fun. It is actually a satirical take on a lot of things. Children are comparatively like empty slates. They are straight-forward in the nature and have innocence preserved. Be raised in a palace or hut, a child is a child by all the means. His/her natural instinct is to play with the others of the same age group. And they learn a lot through playing. We see that boy of a wealthy family (his father is owner of factory(ies)) was getting bored in his home. Their parents were out for some work. And he have no company then a maid who was also busy with her duties. As his passions cross the limit, he went out of the home. The maid tried to stop him (as per the instructions given by the parents of the kid), without a success. The parents were thinking that there are very dirty people living at the Nukkad and it will not be proper for their kid to go and mix with them. The boy otherwise could be infected with some illness. You can understand the attitude if it is related to cleanliness and health. But no, they think actually the people living at Nukkad are cheap by all means, and their child will be either ill-treated by them or may be wrong attributes are implanted into him. Considering the poor or middle-class people not possessing positive attributes and characteristics is wrong. This is the perception which needs to be changed. A person can be good or bad regardless of his financial status. Just speaking a few sentences in English, or study at a convent school or having a dinner in a pricey hotel or having a larger than the life – life style, doesn’t make you good. As we are now so much familiar with the characters of Nukkad and we know that they are living a middle class life, happily. They are honest and pure at heart. They believe in standing with each other in good times or bad. Remember the incident “when an old trumpet player of a band got depressed due to the lack of the work” (Read about it here), how they helped him to cheer up!? So the boy came and started playing cricket with the people at Nukkad. They were all enjoying the game of cricket when the parents of the boy came there along with the police. They claimed that their boy is kidnapped by these people and asked the police inspector to arrest them. Will the boy speak the truth? Will the people at Nukkad be arrested by the police? Will they protest? Will they teach any lesson to the parents of the body? Are the parents of the boy have open mind to learn the lesson? These questions are answered in the rest of the episode. This episode is written nicely. It beauty lies in the simplicity of the execution of the same. Of course, “the people playing cricket” scenes are the important ones and are the pick point of the episode. They are neither larger than the life, nor having over the top background music. It have some humor implanted within though, nicely. You will be laughing by seeing “Dukhiya” getting ready on the crease when he came to bat. The smile will surely irk at your face based on Karim Hajam’s reactions to the game. Even if there were only these two scenes there in the episode, it was worth watching. The unity of the people at Nukkad is shown nicely. From Guru to Pavan to Radha to Kadarbhai to Paanwala and Ganpat, all stand by together in the hard time. They don’t mind speaking the truth at anyone’s face. Are we living like that? If not, can we say we are living a life of freedom? The dialogs are simple yet effective. The sets are realistic. Even the home of the wealthy boy is quite authentic. The wardrobe is nicely chosen and it adds to the authenticity. In terms of acting, everyone plays their part effectively. You can find the maid and the kid are not so natural actors, but or otherwise, everyone is fantastic. Haider Ali’s commentary is good too. Dilip Dhawan is effective. Sangita and others do justice to their roles. Actually leaving anyone’s name is injustice to him/her. The DVD quality is good too. However you can find the audio and video dull when you compare with the HD quality stuff available to us these days. Studded with fine performance, this episode is a satirical take on raising kids, integrated nicely with the game of cricket. An episode word going for, for sure. It is also worth to note that the humour and satire Nukkad explores, is pure and genuine, you can watch it with entire family. It is tough to find such SitComs and satires.